All but one tooth was broken with the force from the lingual toward the labial surface. 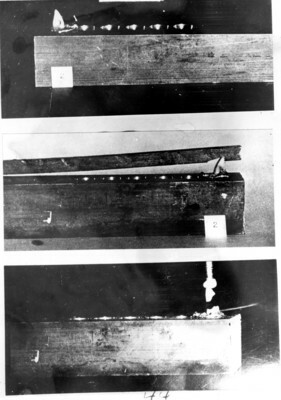 In every instance the fracture was diagonal and similar to the tooth found in Marilyn Sheppard's bed. The medial incisor fractured at an angle that is consistent only with a pull outward, not a blow inward. Because it was not stated in the testimony, it is not clear what portion of the additional teeth contributed the two smaller fragments. If they were chipped from the labial surfaces, as they appeared to be, this could hardly happen from a blow. It seems very clear that the teeth were clamped on something that was forcibly withdrawn with removal of the fragments completely from the mouth.